The Jungle Theater's production of the outrageous dark comedy Detroit is in the middle of its six-week run, so lucky for you there's still time to see it if you haven't yet. 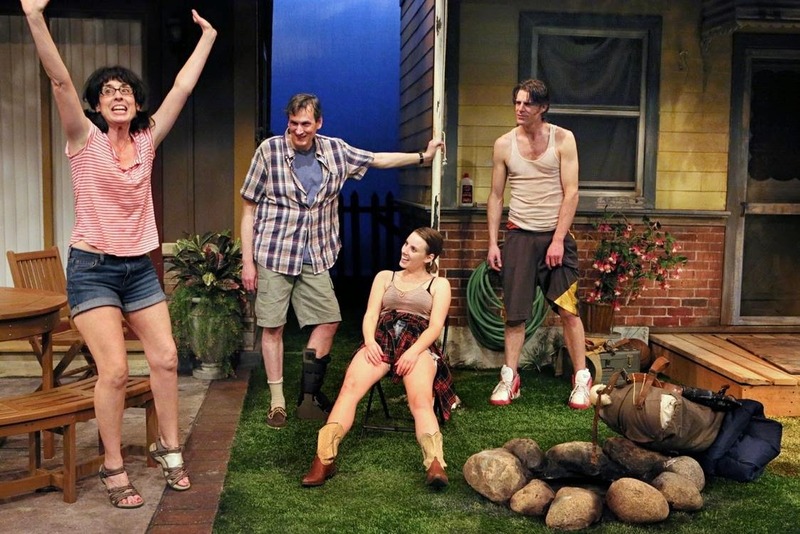 This play by Lisa D'Amour is about two couples living next door to each other in any suburb in America. They meet and develop a friendship, despite the fact that none of them are who they seem to be. It's crazy and funny and poignant at times, as it explores relationships and neighborliness in modern America. 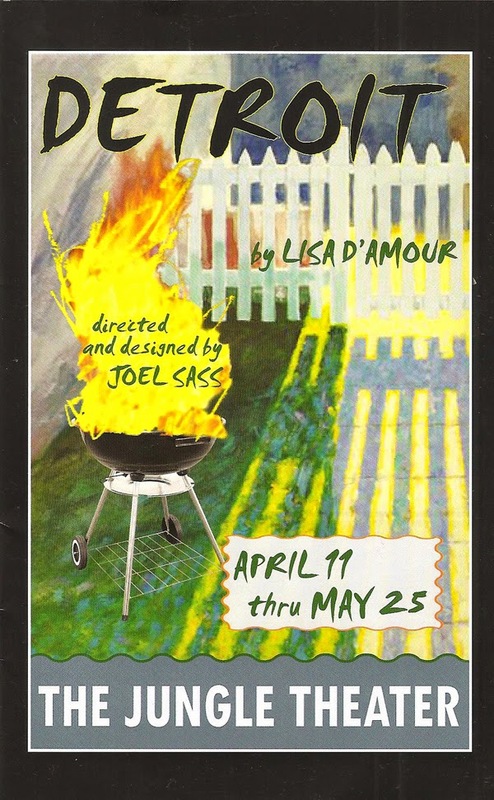 Ben (John Middleton) and Mary (Angela Timberman) invite their new neighbors in the run-down house to a barbecue in the spotless backyard of their charming home. Ben and Mary seem like the average suburban couple, he works at a bank and she works as a paralegal, except that Ben has been laid off and is working on starting his own financial planning business, so he spends a lot of time at home on the computer, much to Mary's annoyance. Sharon (Anna Sundberg) and Kenny (Tyson Forbes) are fresh out of rehab and starting their life over with nothing but a great attitude towards life. Over the course of the nearly two-hour (with no intermission) play, many conversations are had, relationships formed, and secrets revealed. It's a beautiful friendship that changes everyone for good, although maybe not for the better. This cast is perfection, and the four actors work and play together so well that one would almost think that they really do live next door to each other. They're all so funny and devastating and completely in the moment, no matter what crazy thing their character is doing. It's really great fun to watch. As per usual at the Jungle, the director and set designer are one in the same, in this case Joel Sass. He has designed a set that's not just beautiful, with the contrasting facades of the two houses and the perfectly or imperfectly manicured lawns, but is technically impressive as well. I don't want to spoil anything, but do keep an eye on how the set changes scene to scene. The blackout periods between scenes can get a little long, but considering some of the changes that have to happen it's a wonder they're not even longer. Things get broken and repaired, water comes out of the hose, and the grills actually cook the meat. Things turn destructive in the final party scene, leading to what must be an arduous clean-up and resetting of the stage for the next show. The Jungle never lets me down and this is a perfect example of why - a smart, funny, relevant play, fantastic cast, and perfect execution of difficult technical elements. This is a neighborhood you don't want to live in, but it sure is fun to visit for a few hours (just watch your head and your step). Playing now through May 25.